Italian builder Columbus Yachts has given us an exclusive peek at the interiors planned for its 40m Columbus Sport Hybrid yacht. 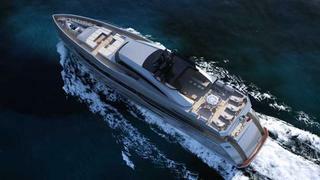 The yacht was ordered by a Russian client in 2011 and the aluminium semi-displacement hull completed in July 2012. Focus has now turned to the interior design by the shipyard team together with the interior designer – Italian studio Hot Lab – and the owner. The client requested a dining table aft in the main saloon, where sliding glass doors on two sides give an alfresco feeling. A master suite is forward on this deck, along with an upper deck lounge and three lower deck guest cabins. Woods were important to the theme of the boat: ‘ likes the sensation of wood, the grain of the wood, its three dimensionality. So the best parts – such as the panelling of walls, coverings on furniture and so on – are done in woods,’ says Romano. These include teak, sycamore, grey durmast American walnut and eucalyptus, while interior floors are in light oak. In line with the yacht’s environmental focus, all woods used are FSC (Forest Stewardship Council) certified to ensure eco-sustainability. These give the scheme a warm feeling, while luxury is provided by brightly coloured leather (treated with a special non-toxic water painting process), Breccia Sarda and Adria Venato marbles, satin gold finishes on metal details and soft wool carpets. For furniture the emphasis is on comfort. On the upper deck the two huge sofas, from the Diesel collection by Moroso, are more than 140cm deep and even Moroso’s ‘compact armchairs’ around a custom-made dining table are selected for how they feel as well as how they look. Romano describes the overall effect as ‘modern chic’, a light, warm, relaxing interior that the owner will be able to use for many years without getting bored. Delivery is scheduled for September 2013.